We arrived at the camp, travelling in army trucks, from a transit camp near Cirencester called Daglingworth. I vividly remember the consternation and gasps of horror among all the adults on the trucks at the sight of the high barbed wire fence that surrounded the camp and the tall watch towers. To them it looked like a concentration camp. To us children it was a new adventure and I promptly climbed up one of the towers and then, naturally, could not get down. I remember being sternly reprimanded. Soon after our arrival the barbed wire fence and the towers were taken down. 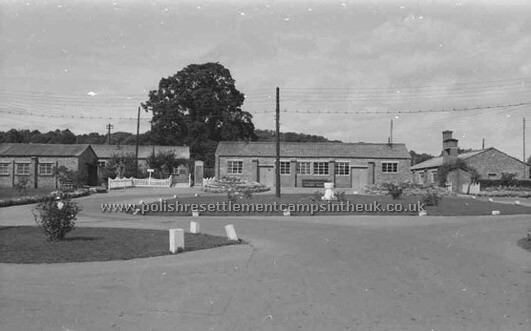 The centre of the camp with the laundry and admin blocks to the left. In the middle is the "Ewidencja" block which was a large hall with two entrances at the front and back of the building. It had 2 or 3 little rooms at each end which were used as a doctors surgery as well as for occasional meetings. Once a week mobile shops spread their goods for sale. It was never locked and it was used by the youth as a central gathering area. Empty nissen huts awaiting families to make them into their homes. Behind the tree you can see a brick ablution block. On arrival at the camp we were all registered and given ID cards. 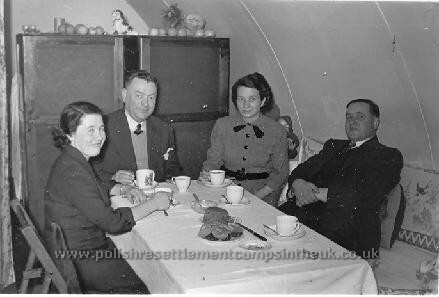 My family of three was allocated half a 'Beczka' a nissen hut, number 42. I remember being led to our new accommodation along a paved foot path with grass ether side tall enough to play hide and seek in. As all displaced persons (DP-s) came with only the clothes on their backs and a small suitcase carrying all their worldly goods, everything had to be provided. The huts were furnished with beds, mattresses, chest of drawers, (one of which I still posses) folding chairs and a table, some basic cutlery and bedding. The sleeping area was divided from the living area by a curtain, so there was little privacy. It was some time later as I was growing up that we moved into a whole nissen hut number 43. The brick wall dividing the hut in the middle had a communicating door so now we had two rooms, a door and 2 windows at each end of the hut. This remained my home until I married in 1963. In the centre of the camp was a large cookhouse and communal mess room which, to begin with, catered for everybody in the camp providing breakfast, lunch, tea and supper. In time as more facilities were provided in the huts like cast iron ranges, pots and pans, many families opted out of communal feeding. They were given their ration books and catered for themselves. We called it to be “na raszynie"
Over the next two years more families arrived at the camp. Many had travelled half way around the world, being pushed from pillar to post. 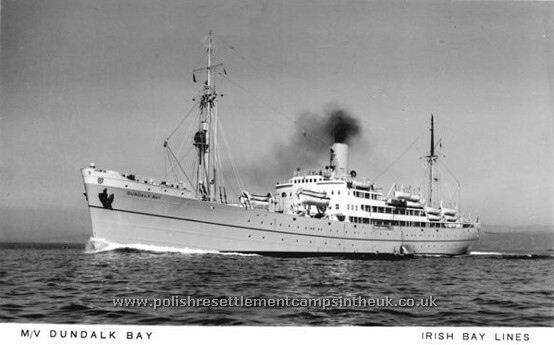 From camps in Siberia, through the Middle East to Africa and India finally arriving in England in the late 40's and early 50's. 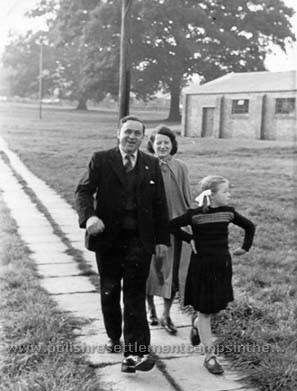 My future husband and his family, all together 1014 D.Ps, arrived in Hull on the 2/9/1950 having left Mombasa on the "Dundalk Bay" on the 12th August. 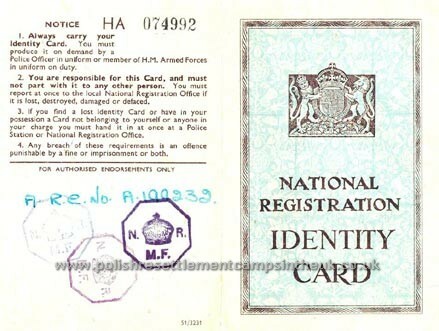 After processing at Priory Road reception centre they were dispersed to various camps throughout the UK. 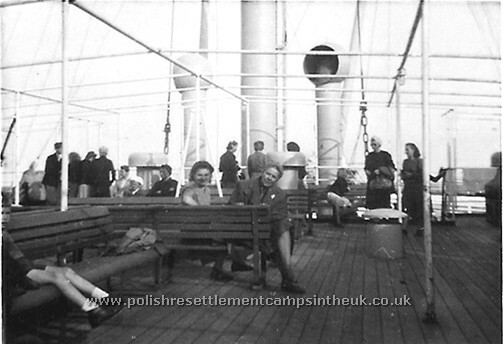 On board the Dundalk Bay, visible in the photo is the framework on which the crew spread canvas sheets to provide shade in the tropics. 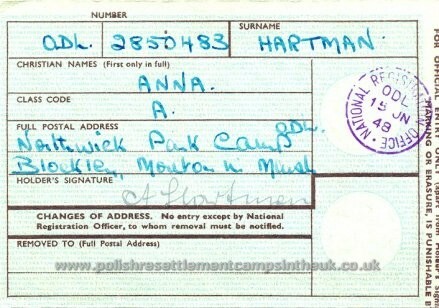 141 went to Northwick Park, the rest to other camps and private housing. 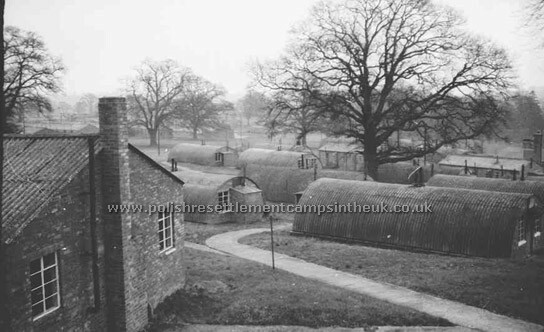 As more people arrived at the camp all the individual huts were quickly occupied and new families had to be housed in the wards of the brick barracks. As three or four families had to share a ward, which at the time had not yet been converted into individual rooms, blankets were hung from the metal rafters as screens so that people could get a little privacy. Unlike today's asylum seekers, people then were grateful just to have a bit of stability and a roof over their heads, albeit in corrugated asbestos nissen huts or "rooms" divided with blankets.